Area: 1,240,278 sq. km. (474,764 sq. mi. ); about the size of Texas and California combined. Cities: Capital: Bamako (pop. 1,728,444). Other cities — Segou (200,000), Sikasso (192,000), Mopti (103,428), Gao (65,000), Kayes (65,000), Timbuktu (38,000). Climate: Semitropical in the south; arid in the north. Nationality: Noun and adjective — Malian(s). Population (2011 est. ): 14.1 million. Annual population growth rate (2011 est. ): 2.61%. Ethnic groups: Manding (Bambara or Bamana, Malinke) 52%, Fulani 11%, Saracole 7%, Mianka 4%, Songhai 7%, Tuareg and Maur 5%, other 14%. Religions: Islam 90%, indigenous 6%, Christian 4%. Languages: French (official) and Bambara (spoken by about 80% of the population). Education: Enrollment: 91% (primary, 2008). Literacy — 26%. Health: Infant mortality rate: 111/1,000. Life expectancy (2011 est.) — 52 years. Work force (4 million): Agriculture 70%; services 15%; industry and commerce 15%. Constitution: Approved by referendum January 12, 1992. Branches: Executive: president (chief of state and commander in chief of the armed forces), prime minister (head of government). Legislative — National Assembly is the sole legislative arm of the government; currently consisting of 147 members. Judicial — Supreme Court with both judicial and administrative powers. Political parties: Mali is a multiparty democracy. Sixteen political parties are represented in the National Assembly; others are active in local government. Administrative subdivisions: Eight regions and capital district. Central government budget (2009): Revenues — $1.451 billion; expenditures — $2.232 billion; $781 million deficit. GDP (2010 est. ): $9 billion. Avg. annual growth rate (2010 est. ): 4.5%. Per capita income (2010 est. ): $691. Annual skilled worker's salary: $1,560. Avg. consumer price inflation rate (2009): 2.2%. Natural resources: Gold, phosphate, kaolin, salt, and limestone currently mined; deposits of oil, bauxite, iron ore, manganese, lithium, and uranium are known or suspected. Agriculture, livestock, and fishery (32.9% of GDP): Products — millet, sorghum, corn, rice, livestock, sugar, cotton, groundnuts (peanuts), and tobacco. Industry (21.3% of GDP): Types: food processing, textiles, cigarettes, fish processing, metalworking, light manufacturing, plastics, and beverage bottling. Services (45.8% of GDP): Telecommunications, construction. Trade (2009): Exports: $2.079 billion: cotton and cotton products, gold, livestock, fish, tannery products, groundnuts. Major markets — France, Switzerland, Italy, Thailand, Cote d'Ivoire, and Algeria. Imports — $2.292 billion: petroleum products, foodstuffs, machinery and spare parts, vehicles, chemicals and pharmaceuticals, textiles. Major suppliers — France, Cote d'Ivoire, Senegal, China, U.S. ($31 million), Germany, and Japan. Mali's population consists of diverse sub-Saharan ethnic groups, sharing similar historic, cultural, and religious traditions. Exceptions are the Tuaregs and Maurs, desert nomads, related to the North African Berbers. Although each ethnic group speaks a separate language, nearly 80% of Malians communicate in Bambara, the common language of the marketplace. Historically, good interethnic relations throughout much of the country were facilitated by easy mobility on the Niger River and across the country's vast savannahs. Each ethnic group was traditionally tied to a specific occupation, all working within close proximity. The Bambara, Malinke, and Dogon are farmers; the Fulani, Maur, and Tuareg are herders; the Soninkes or Saracoles are traders; while the Bozo are fishers. In recent years, this linkage has shifted as ethnic groups seek diverse, nontraditional sources of income. The Tuaregs have had a history of struggle since Mali's independence in 1960. A series of rebellions, which were the result of a struggle for greater autonomy, to preserve traditional Tuareg ways of life, and to share in the benefits of a modernizing Malian state, led to clashes with the military from 1963 to 1964 and 1990 to 1996. Peace accords, signed in 1992, aimed to allow greater autonomy in the north and increase government resource allocation to the impoverished region. The peace agreement was celebrated in 1996 in Timbuktu during an official and highly publicized ceremony called Flamme de la Paix — peace flame. Since then, some Tuareg groups have criticized the government for failing to fully implement the terms of the agreement. Malians express great pride in their ancestry and pride themselves on a long history of peaceful coexistence among ethnic groups. Mali is the cultural heir to the succession of ancient African empires — Ghana, Malinke, and Songhai — that occupied the West African savannah. These empires controlled Saharan trade and were in touch with Mediterranean and Middle Eastern centers of civilization. The Ghana Empire, dominated by the Soninke or Saracole people and centered in the area along the Malian-Mauritanian frontier, was a powerful trading state from about A.D. 700 to 1075. The Malinke Kingdom of Mali had its origins on the upper Niger River in the 11th century. Expanding rapidly in the 13th century under the leadership of Soundiata Keita, it reached its height about 1325, when it conquered Timbuktu and Gao. Thereafter, the kingdom began to decline, and by the 15th century, it controlled only a small fraction of its former domain. The Songhai Empire expanded its power from its center in Gao during the period 1465-1530. At its peak under Askia Mohammad I, it encompassed the Hausa states as far as Kano (in present-day Nigeria) and much of the territory that had belonged to the Mali Empire in the west. It was destroyed by a Moroccan invasion in 1591. Timbuktu was a center of commerce and of the Islamic faith throughout this period, and priceless manuscripts from this epoch are still preserved in Timbuktu. The United States and other donors are making efforts to help preserve these priceless manuscripts as part of Mali's cultural heritage. French military penetration of the Soudan (the French name for the area) began around 1880. Ten years later, the French made a concerted effort to occupy the interior. The timing and resident military governors determined methods of their advances. A French civilian governor of Soudan was appointed in 1893, but resistance to French control did not end until 1898, when the Malinke warrior Samory Toure was defeated after 7 years of war. The French attempted to rule indirectly, but in many areas they disregarded traditional authorities and governed through appointed chiefs. As the colony of French Soudan, Mali was administered with other French colonial territories as the Federation of French West Africa. In 1956, with the passing of France's Fundamental Law (Loi Cadre), the Territorial Assembly obtained extensive powers over internal affairs and was permitted to form a cabinet with executive authority over matters within the Assembly's competence. After the 1958 French constitutional referendum, the Republique Soudanaise became a member of the French Community and enjoyed complete internal autonomy. In January 1959, Soudan joined Senegal to form the Mali Federation, which became fully independent within the French Community on June 20, 1960. The federation collapsed on August 20, 1960, when Senegal seceded. On September 22, Soudan proclaimed itself the Republic of Mali and withdrew from the French Community. President Modibo Keita — whose party Union Soudanaise du Rassemblement Democratique Africain (US/RDA) had dominated preindependence politics — moved quickly to declare a single-party state and to pursue a socialist policy based on extensive nationalization. A continuously deteriorating economy led to a decision to rejoin the Franc Zone in 1967 and modify some of the economic excesses. On November 19, 1968, a group of young officers staged a bloodless coup and set up a 14-member Military Committee for National Liberation (CMLN), with Lt. Moussa Traore as President. The military leaders attempted to pursue economic reforms but for several years faced debilitating internal political struggles and the disastrous Sahelian drought. A new constitution, approved in 1974, created a one-party state and was designed to move Mali toward civilian rule. However, the military leaders remained in power. In September 1976, a new political party was established, the Democratic Union of the Malian People (UDPM), based on the concept of democratic centralism. Single-party presidential and legislative elections were held in June 1979, and Gen. Moussa Traore received 99% of the votes. His efforts at consolidating the single-party government were challenged in 1980 by student-led, anti-government demonstrations, which were brutally put down, and by three coup attempts. The political situation stabilized during 1981 and 1982 and remained generally calm throughout the 1980s. The UDPM spread its structure to cercles and arrondissements (administrative subdivisions) across the land. Shifting its attention to Mali's economic difficulties, the government approved plans for cereal marketing liberalization, reform in the state enterprise system, and new incentives to private enterprise, and worked out a new structural adjustment agreement with the International Monetary Fund (IMF). However, by 1990, there was growing dissatisfaction with the demands for austerity imposed by the IMF's economic reform programs and the perception that the President and his close associates were not themselves adhering to those demands. As in other African countries, demands for multiparty democracy increased. The Traore government allowed some opening of the system, including the establishment of an independent press and independent political associations, but insisted that Mali was not ready for democracy. In early 1991, student-led, anti-government rioting broke out again, but this time government workers and others supported it. On March 26, 1991, after 4 days of intense anti-government rioting, a group of 17 military officers arrested President Traore and suspended the constitution. Within days, these officers joined with the Coordinating Committee of Democratic Associations to form a predominantly civilian, 25-member ruling body, the Transitional Committee for the Salvation of the People (CTSP). The CTSP then appointed a civilian-led government. A national conference held in August 1991 produced a draft constitution (approved in a referendum January 12, 1992), a charter for political parties, and an electoral code. Political parties were allowed to form freely. Between January and April 1992, a president, National Assembly, and municipal councils were elected. On June 8, 1992, Alpha Oumar Konare, the candidate of the Alliance for Democracy in Mali (ADEMA), was inaugurated as the President of Mali's Third Republic. In 1997, attempts to renew national institutions through democratic elections ran into administrative difficulties, resulting in a court-ordered annulment of the legislative elections held in April 1997. The exercise, nonetheless, demonstrated the overwhelming strength of President Konare's ADEMA Party, causing some other historic parties to boycott subsequent elections. President Konare won the presidential election against scant opposition on May 11. In the two-round legislative elections conducted on July 21 and August 3, 1997, ADEMA secured more than 80% of the National Assembly seats. General elections were organized in June and July 2002. President Konare did not seek reelection since he was serving his second and last term as required by the constitution. All political parties participated in the elections. In preparation for the elections, the government completed a new voter's list after a general census was administered a few months earlier with the support of all political parties. Retired General Amadou Toumani Toure, former head of state during Mali's transition (1991-1992) became the country's second democratically elected President as an independent candidate in 2002, and was reelected to a second 5-year term in 2007. The next round of presidential elections is scheduled for April 2012. Under Mali's 1992 constitution, the president is chief of state and commander in chief of the armed forces. The president is elected to a 5-year term, with a limit of two terms. The president appoints the prime minister as head of government. The president chairs the Council of Ministers (the prime minister and currently 28 other ministers, including 5 women), which adopts proposals for laws submitted to the National Assembly for approval. The National Assembly is the sole legislative arm of the government. It currently consists of 147 members. Representation is apportioned according to the population of administrative districts. Election is direct and by party or independent list. The term of office is 5 years. The Assembly meets for two regular sessions each year. It debates and votes on legislation proposed either by one of its members or by the government and has the right to question government ministers about government actions and policies. Sixteen political parties, aggregated into five parliamentary groups, are represented in the Assembly. In legislative elections held in July 2007, the ADEMA Party regained the majority it lost in 2002, winning 51 seats, ahead of another party aligned with President Toure, the Union for Republic and Democracy (URD), which won 36. The former majority party at the National Assembly, the Rassemblement Pour le Mali (RPM) of former Prime Minister Ibrahim B. Keita, won 11 seats. Other than the RPM, President Toure has the support of most of the political parties represented in the National Assembly. Mali's constitution provides for a multiparty democracy, with the only restriction being a prohibition against parties based on ethnic, religious, regional, or gender lines. In addition to those political parties represented in the National Assembly, others are active in municipal councils. Administratively, Mali is divided into eight regions and the capital district of Bamako, each under the authority of an appointed governor. Each region consists of five to nine districts (or cercles), administered by prefets (commandants). Cercles are divided into communes, which, in turn, are divided into villages or quarters. Since independence, successive governments have shown varying levels of commitment to a process of decentralization, whereby local governments would have greater control over resource allocation. Under the current administration, this process is ongoing, with the establishment of 702 elected municipal councils, headed by elected mayors. Election of local officials took place; greater local control over finances and the reduction of administrative control by the central government are being implemented. 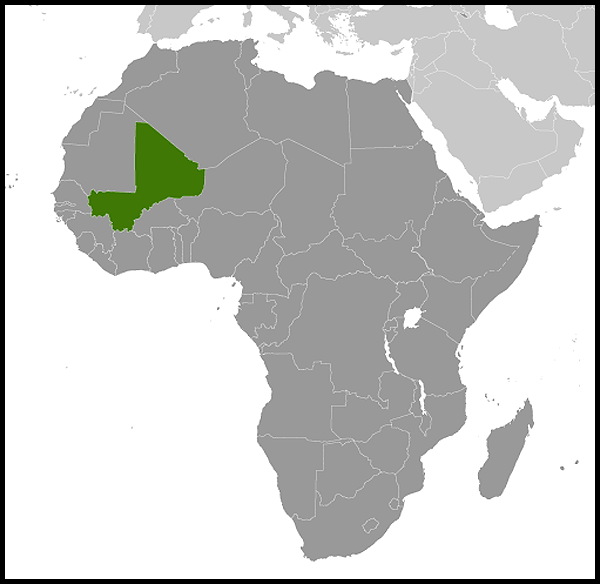 Mali's legal system is based on codes inherited at independence from France. New laws have been enacted to make the system conform to Malian life, but French colonial laws not abrogated still have the force of law. The constitution provides for the independence of the judiciary. However, the Ministry of Justice appoints judges and supervises both law enforcement and judicial functions. The Supreme Court has both judicial and administrative powers. Under the constitution, there is a separate constitutional court and a high court of justice with the power to try senior government officials in cases of treason. Mali maintains an embassy (http://www.maliembassy.us/) in the United States at 2130 R Street NW, Washington, DC 20008 (tel. 202-332-2249), and a permanent mission to the United Nations at 111 E. 69th Street, New York, NY 10020 (212-734-4150). Mali's estimated 2010 per capita gross domestic product (GDP) of $691 placed it among the world's 10 poorest nations. Its potential wealth lies in mining and the production of agricultural commodities, livestock, and fish. Agricultural activities occupy 70% of Mali's labor force and provide about 33% of the GDP. Cotton, gold, and livestock made up 80%-90% of total export earnings in Mali in 2006. Small-scale traditional farming dominates the agricultural sector, with subsistence farming — of cereals, primarily sorghum, millet, and maize — on about 90% of the 1.4 million hectares (3.4 million acres) under cultivation. The high cost of petroleum products, the fall in the world market price for cotton and gold, and corresponding loss of customs revenues put pressure on the economy and led the government to be very tight on cash disbursements in recent years. A landlocked country, Mali's economy remains vulnerable to external shocks, including political crisis in neighboring countries. 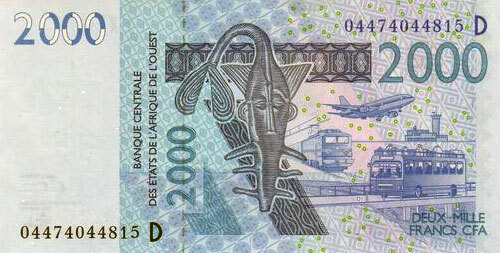 The recent political crisis in Cote d'Ivoire increased transportation costs and put pressure on the fragile Malian economy. Nonetheless, a focus on quality cotton production and double-digit increases in cereal and gold production boosted real GDP growth from 3.2% in 2000 to an estimated 4.5% in 2010. Rice is grown extensively along the banks of the Niger between Segou and Mopti, with the most important rice-producing area at the Office du Niger, located north of Segou toward the Mauritanian border. Using water diverted from the Niger, the Office du Niger irrigates about 80,000 hectares of land for rice and sugarcane production. About one-third of Mali's paddy rice is produced at the Office du Niger. The Niger River also is an important source of fish, providing food for riverside communities; the surplus — smoked, salted, and dried — is exported. Due to drought and diversion of river water for agriculture, fish production has steadily declined since the early 1980s. The government has started plans to develop fish breeding, mainly in the Niger delta, in order to boost fish production. Sorghum is planted extensively in the drier parts of the country and along the banks of the Niger in eastern Mali, as well as in the lakebeds in the Niger delta region. Farmers near the town of Dire have cultivated wheat on irrigated fields for hundreds of years during the dry season. Peanuts are grown throughout the country but are concentrated in the area around Kita, west of Bamako. Mali's resource in livestock consists of millions of cattle, sheep, and goats. Approximately 40% of Mali's herds were lost during the great drought in 1972-74. The level was gradually restored, but the herds were again decimated in the 1983-85 drought. The overall size of Mali's herds is not expected to reach pre-drought levels in the north of the country, where encroachment of the desert has forced many nomadic herders to abandon pastoral activities and turn instead to farming. The largest concentrations of cattle are in the areas north of Bamako and Segou extending into the Niger delta, but herding activity is gradually shifting southward, due to the effects of previous droughts. Until the mid-1960s, Mali was self-sufficient in grains — millet, sorghum, rice, and corn. Diminished harvests during bad years, a growing population, changing dietary habits, and, most importantly, policy constraints on agricultural production resulted in grain deficits almost every year from 1965 to 1986. Production has rebounded since 1987, however, thanks to agricultural policy reforms undertaken by the government and supported by the Western donor nations. Liberalization of producer prices and an open cereals market have created incentives to production. These reforms, combined with adequate rainfall, successful integrated rural agriculture programs in the south, and improved management of the Office du Niger, have led to surplus cereal production over the past 5 years. In recent years, Mali has invested in its cotton industry, which employs an estimated three million Malians directly and indirectly, in an attempt to boost production. Mining is still a growing industry in Mali, with gold accounting for some 80% of mining activity. There are considerable proven reserves of other minerals not currently exploited. In 2002, gold briefly became Mali's number one export, before cotton and livestock. There are two large private investments in gold mining: Anglo-American ($250 million) and Randgold ($140 million), both multinational South African companies located respectively in the western and southern part of the country. During the colonial period, private capital investment was virtually nonexistent, and public investment was devoted largely to the Office du Niger irrigation scheme and to administrative expenses. Following independence, Mali built some light industries with the help of various donors. Manufacturing, consisting principally of processed agricultural products, accounted for about 24% of GDP in 2005. Tourism is Mali's third-largest export, comprising 2.4% of GDP. The sector, which is vulnerable to external shocks, has suffered from the security situation in northern Mali. Mali's national parks, its ancient cities and archeological sites, Niger River cruises, cultural festivals, and magnificent desert landscapes are major attractions. Mali also is home to a rare herd of elephants that continues its unique annual migration to the edges of the Sahara Desert in the northern part of the country. Under the economic reform program implemented in collaboration with the World Bank and the IMF in 1988, the government has taken a number of steps to liberalize the regulatory environment and attract private investment. For example, investors can now consult a one-stop shop, or guichet unique, which streamlines the process for opening a business. Price controls, import quotas, and export taxes on consumer goods have been eliminated. The Commerce Code was revised in 1991 to remove impediments to commercial activity. The investment and the mining codes also were revised in the early 1990s in order to present a good investment climate. Also in 1991, a system of commercial and administrative courts was established to handle private trade complaints and claims against the government. Together, these reforms have improved the business environment. In the 2010 Doing Business Report, Mali ranked 156 of 183 countries, an improvement of six points from the previous year. Furthering structural reform, the government has sought to privatize a number of parastatal companies. The cotton seed oil factory (Huilerie Cotonniere du Mali, or Huicoma), was privatized 2005; the telecommunications company, Societe de Telecommunications du Mali (SOTELMA) was privatized in 2009; and the Cotton Ginning Company (CMDT) is in the process of being privatized. Mali is a major recipient of foreign aid from many sources, including multilateral organizations (most significantly the World Bank, the African Development Bank, and Arab Funds), and bilateral programs funded by the European Union, France, United States, Canada, Netherlands, Denmark, and Germany, among others. Before 1991, the former Soviet Union had been a major source of economic and military aid, including construction of a cement plant and the Kalana gold mine. Currently, aid from Russia is restricted mainly to training and provision of spare parts. Chinese aid remains high, and Chinese-Malian joint venture companies became more numerous during the period 1999-2002, leading to the opening of a Chinese investment center. China is a major participant in the textile and the sugar refinery industries and in large-scale construction projects, including irrigation infrastructures in the Niger Valley Authority (Office du Niger), a bridge across the Niger, a conference center, an expressway in Bamako, a new national stadium in Bamako, four regional stadiums completed for the Africa Cup competition in 2002, a hospital in Mopti, and a highway interchange and third bridge in Bamako. In 2010, the Department of State and USAID gave $117.87 million in bilateral foreign assistance to Mali. Mali is a focus country for a number of presidential initiatives, including Feed the Future, Global Health Initiative, President's Malaria Initiative, and Global Climate Change. Mali benefits from a $461 million Millennium Challenge Corporation compact, implemented in 2007, to develop 5,200 hectares of irrigable agricultural land and improve the international airport. Mali participates in the Trans-Sahara Counter Terrorism Partnership (TSCTP), which brings together U.S. Government resources and expertise for collaborative security initiatives. Since 1971, Peace Corps volunteers have contributed to projects in the areas of education, clean water, food security, environmental conservation, microenterprise, and preventive health care. Mali is currently host to approximately 150 volunteers, making this one of the largest programs in sub-Saharan Africa. Mali's armed forces number some 7,000 and are under the control of the Minister of Defense and Veterans, as is the National Guard. The Gendarmerie and local police forces are under the Ministry of Security and Civil Protection. The police and gendarmes share responsibility for internal security; the police are in charge of urban areas only. In the 1960s and 1970s, Mali's Army and Air Force relied primarily on the Soviet Union for materiel and training. A few Malians receive military training in the United States, France, and Germany. Under TSCTP, the United States provides equipment and training to Mali's military with the aim of increasing Mali's capacity to meet its own security challenges in the vast expanse of the Sahel. Since independence in 1960, Malian governments have shifted from an ideological commitment to socialism and a policy alignment with communist states to pragmatism that judges issues on their merits, welcomes assistance from all sources, and encourages private investment. The present government, which assumed office in 2002, is committed to democracy, economic reform, free market policies, regional integration, and international cooperation on peacekeeping and counterterrorism activities. Mali is a member of the UN and many of its specialized agencies, including the International Monetary Fund (IMF) and the World Bank; the International Labor Organization (ILO); the International Telecommunications Union (ITU); and the Universal Postal Union (UPU). It also belongs to the African Union (AU); the Organization of Islamic Cooperation (OIC); the Non-Aligned Movement (NAM); and the African Development Bank (ADB). Mali also is an associate member of the European Union (EU). 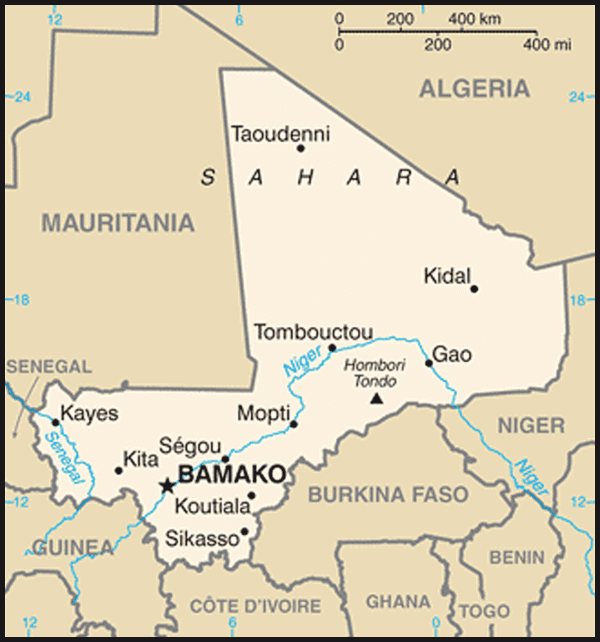 Mali is active in regional organizations. It participates in the Economic Community of West African States (ECOWAS) and the West African Economic Monetary Union (UEMOA) for regional economic integration; Liptako-Gourma Authority, which seeks to develop the contiguous areas of Mali, Niger, and Burkina Faso; the Niger River Commission; the Permanent Interstate Committee for Drought Control in the Sahel (CILSS); and the Senegal River Valley Development Organization (OMVS). U.S.-Malian relations are excellent and expanding. They are based on shared goals of strengthening democracy and reducing poverty through economic growth. The bilateral agenda is dominated by efforts to increase broad-based growth, improve health and educational facilities, counter the spread of highly infectious diseases, encourage regional stability, build peacekeeping capabilities, institutionalize respect for human rights, and strengthen democratic institutions in offering good governance. Mali currently is a small market for U.S. trade and investment, but there is potential for growth as its economy expands. Mali is a leading regional partner in U.S. efforts against terrorism. Mali is also host to a world-class National Institutes of Health laboratory and research facility whose aim is to develop anti-malaria vaccines and medicines. USAID, Peace Corps, and other U.S. Government programs play a significant role in fostering sustainable economic and social development. USAID programs also strengthen efforts to consolidate the peace process in northern Mali and the region's socioeconomic and political integration. Defense Department security assistance programs and training support build Mali's capacity to meet its various security challenges. The U.S. Embassy is located at ACI 2000 Rue 243, Porte 297, Bamako, tel. : (223) 2070 2300, fax: (223) 2070 2479. The embassy website is (http://mali.usembassy.gov/).